I love meeting Authors (big A, you know, the published, the people I admire, whose writing I love). Unfortunately, they are the people I tend to lose my marbles around quickest. I mean, I can hold it together just fine in front of TV stars, famous athletes, etc., but I absolutely puddle for writers. I met Clive Barker once, and I couldn't get two coherent words out of my mouth. Helper Monkey had to tell him my name to have him sign my book. That was about 17 years ago, though, so I hoped I'd become a little less of a dork. Thursday night I realized that I might not be a mumbling incoherent dork anymore, but that's only because I learned to be louder. Okay, I have to mention the books for a second. Incarnate is about a girl born into a society where every other person is a reincarnated soul who takes the memories of each lifetime to their next lifetime. The same souls had been born over and over again, until Ana came along instead of the soul everyone expected her to be. Hilarity ensues. Well, not hilarity. But Lots of Things ensue. Especially Sam. You will want to know about Sam. I couldn't wait to get my hands on Asunder, and I'm not going to give you spoilers. Once you see the cover, you'll want to read them anyway. 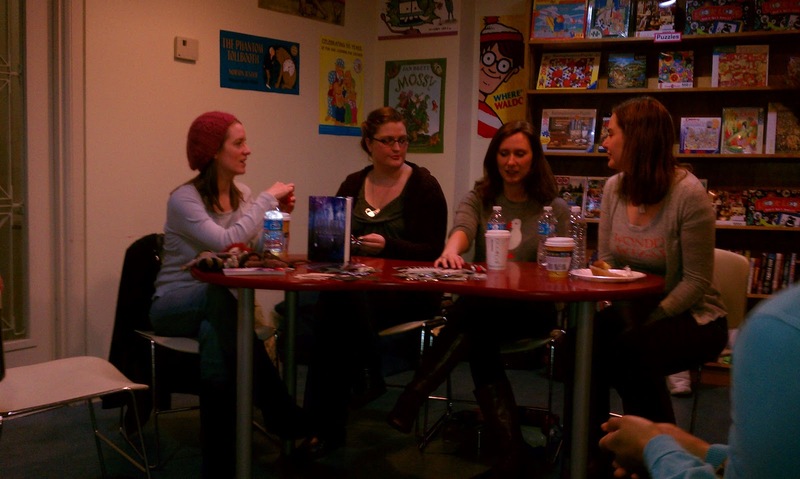 When I looked up the details of the event, hosted by Hooray for Books in Alexandria, Virginia, I was intrigued by the other three authors participating. I hadn't read their books yet, and after meeting them, I put all three of their books on top of my TBR list. The only picture I was able to take before my phone battery died. From left to right, they are Jodi Meadows, The Megans (as Lulu called them), Megan Spooner, author of Skylark (in a society under a dome where she's never seen the sky, Lark discovers she might be something out of legend when it was her turn to give up her innate magic to power the dome), and Megan Shepherd, author of The Madman's Daughter (which is a really interesting take on the Island of Doctor Moreau told from the POV of the doctor's daughter, so you know I want to read this as a HUGE Wells fan), and Lenore Appelhans, author of Level 2 (an unusual look at an afterlife where memories are currency. More memories means more wealth). The audience was lovely. I was not. Lulu wanted to suggest a page number for Jodi to read, but I'd already decided on one, and I SHOUTED DOWN MY OWN KID. But it gets better (worse). Jodi asked one question from Incarnate, with the prize of a pair of incredible hand-made Jodi Mitts. I did raise my hand, and Lulu didn't, but she swears she knew the answer too. I know she did, but she's not a hand raiser. You snooze, you lose, kiddo. And I didn't even answer the question 100% correctly, but still won the mitts. Sure, I am Mittens. Mittens needs mitts. But I promised to share them 50-50 with Lulu. 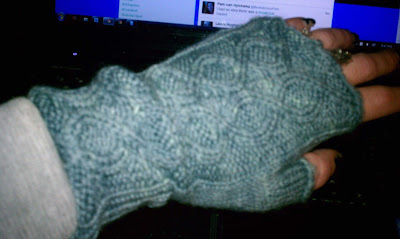 Precious Mitts! They are SOOOOOO soft. I also wanted to tell Jodi a silly story that took place shortly after Incarnate was released. I believe it was the Authoress who tweeted that Jodi was giving away Fluff Ponies, and to contact her if you wanted one. So I did. I hadn't read Incarnate yet, but how can you not after receiving a Fluff Pony with Super Magical Powers? Congratulations! Your request for a fluff pony has been APPROVED. Welcome to your new life with your fluff pony. Your fluff pony is fully loaded and ready for battle. Note the laser bracelets and cuffs; those are weapons. Note the pointy horn; that is a weapon. See the wings? Those aren't weapons. Those are for getting you to the doorstep of your enemy so you can DESTROY. (Or away from your enemy, if necessary.) The glasses are to allow your fluff pony to SEE THROUGH WALLS so you can attack while your enemy is showering or otherwise vulnerable. You are awesome. You deserve nothing but the best fluff pony available. I named him George. Every once in a while, when I really need to feel like I could arrive at the doorstep of my enemy and be prepared to destroy said enemy, I have a little visit with George. But when it was our turn to have our copy of Asunder signed? I babbled incoherently for about 10 seconds and then ran for the hills. No cute story about the fluff pony. No reminding her that I said hi on twitter a few times, including the day before the event. Total incoherence. Thanks to all the authors and Hooray for Books. We had a great time. Ahhh! I am so jealous of your mitts! She gave away two sets at the event I attended and I didn't win either one because they had rounds of trivia. ROUNDS. My daughter made it to the second round. Plus, because I sat too far away from Jodi, someone else got my question butterfly. I may have pouted. Also, I feel you on the whole makes-idiot-of-self-in-front-of-authors problem. I won't even go into the whole Joe Hill debacle. Came here from Jodi's post. I think I was sitting behind you at the event, which was so much fun. I'm so glad I was able to attend even though it involved driving a total of 7 hours that day (3.5 each way). I totally get you on becoming weird in front of authors. I'm very shy so there are times I'll get up to an author and basically be mute the whole time except to say my name and thank you, lol. But I'm getting better as I meet more and more and spend time with them. Anyway, great recap and loved that email about the Fluff Pony. So funny! It was a lot of fun! And I thought my hour and twenty minute drive was a long way! Thanks so much for coming to see us! And congrats on winning the mitts. I am sooo envious!! It was a great event, and we had a ton of fun! Thank YOU for coming! My daughter is now plotting her own novel, and comes home from school every day with notes written on her hands in red ink. I think she was incredibly inspired by all four of you. Truly, thank you!